Weight: 3.68 g., 16.5 mm. Augustus. 27 BC-AD 14. AR Denarius, 3.68 g, 16.5 mm, 6h. Uncertain Spanish mint (Colonia Patricia?). 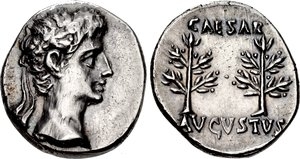 Struck circa 20/19-17/6 BC. Obv. Laureate head right, Rev. CΛESΛR above, AVGVSTVS below, two laurel branches (or trees). RIC I 51; RSC 47. Extremely Fine full weight flan, lightly toned. $1700.